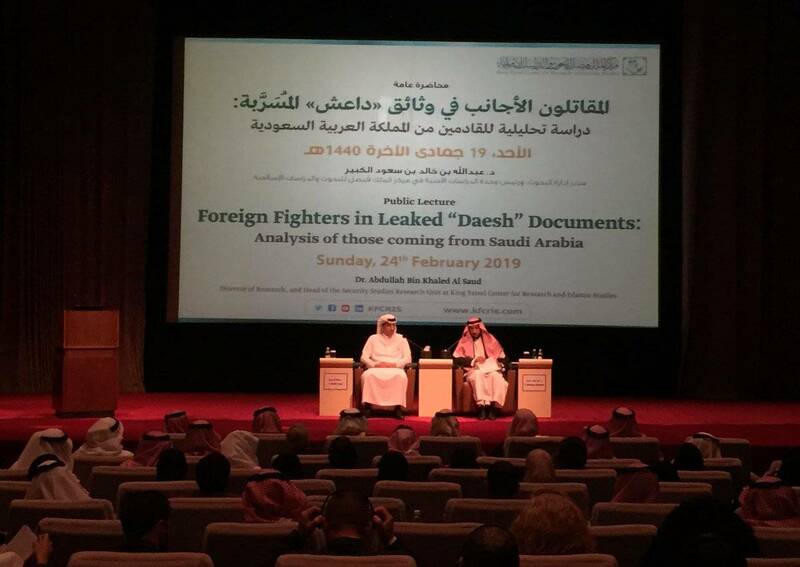 The King Faisal Center for Research and Islamic Studies hosted a lecture on Sunday, February 24th 2019, entitled “Foreign Fighters in Leaked ‘Daesh’ Documents: Analysis of those coming from Saudi Arabia” presented by Prince Abdullah bin Khaled Al-Saud, Director of the KFCRIS Research Department. At the beginning of the lecture, Abdullah bin Khaled spoke about the secret documents that were leaked in 2016 containing a wealth of information about the new recruits who sought to join “Daesh” in Syria. It was the largest collection of primary sources from the organization itself and available to the public. The number of arrivals from Saudi Arabia in the leaked documents reached 759 fighters joining the organization of Daesh, and their average age was less than 24 years old. In terms of the variation of ages, the oldest was 56 and the youngest was 9 years old with a father. 87% were younger than 30. The vast majority arose and became aware of the post-9/11 era and the “war on terror” era. However, they were attracted to extremism and in greater numbers than before. The leaked report indicated that all 13 administrative regions in Saudi Arabia are represented in terms of the Saudi terrorist fighters who sought to join Daesh. It is clear that the Saudi group in Daesh was not all limited in education. Based on this, it therefore possible to say that many of them did not suffer from deprivation of economic opportunities and social advancement. But there may be relative deprivation of relevance in this aspect. - New generation that is more radical, diverse and faster mobilized than its predecessor. - Extremism was in response to current and new events. - War, violence, instability create an environment where extremism is growing. - The Internet facilitated interaction and mobilization in ways that were not previously available. - Secondary role of religious ideology in the process of extremism. - The importance of a broad approach that transcends purely socio-economic factors or pure religious ideology.